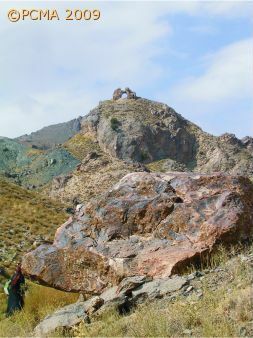 A Polish team from the University of Warsaw (PCMA), in co-operation with the Iranian Center for Archaeological Research conducted a reconnaissance survey at the site of Khone-ye Div located in the Kopet Dagh mountains, near the mountain villages of Foshtonogh (Foshtanq) and Rivand (Revand) in the Razavi Khorasan province of northeastern Iran. The campaign aimed at documenting the remnants of a chahar-taq (Persian: four arches) and at establishing the layout of the site. Discovered and briefly studied in 1985, the chahar-taq, built of stones bonded with gypsum mortar, was recognized as a fire temple, an identification fully verified by this year’s findings. Inside the chahar-taq, two white-plastered stone platforms were discovered. They have parallels in other fire temples. There may have once been four such platforms symmetrically arranged around a central altar. Only one arch remains of the upper part of temple. Slabs falling from a gradually disintegrating dome destroyed the temple interior. The poor preservation of the structure is due not only to the natural process of erosion but also to the collapse of the superstructure, which left the walls disjointed and unstable. The process of deterioration seems to have accelerated in recent years. Several years ago, two of the four arches were still standing, and the rock-cut stairs facilitating access to the temple are said to have fallen into ruin a mere 40 years ago. The unique location of the temple, on a high rocky spur hidden between two hill ridges and overlooking the Rivand stream valley, was certainly a challenge for ancient architects. Some irregularities in the layout of the chahar-taq may be due to the need for adapting this architectural form to topographical features. The same requirements for optimum use of available space pushed the architects to build some terracing structures west of the temple. On the other hand, there were ritual requirements the builders needed to meet. One of them was certainly the rite of ablution. Remnants of a sizeable water reservoir unearthed north of the temple prove the importance of that element of ritual. The site can be dated by scant pottery evidence. Neyshabur-type pottery found above the floor level of the chahar-taq, in a layer of soft soil marking the abandonment of the building, indicates that the temple was no longer in use after the 9th-10th century AD. There remains the question of what kind of fire temple was constructed in a place unlikely to have been attended regularly by worshippers. The location of the temple on a mountain top may have been dictated by the ancient Iranian tradition of climbing to high places for communal worship. The tradition persists to this day, as can be seen in the case of the Zoroastrians of Yazd, who constructed sanctuaries for festive gatherings in the mountains both in ancient times and in the last century. However, a Zoroastrian ever-burning fire needs constant fuel and its servitors likewise require sustenance. Therefore, there could never have been a question of establishing eternal fires at remote and inaccessible sites. 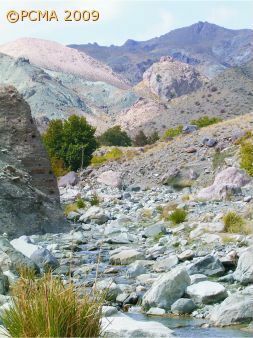 However, the access to Khone-ye Div, although difficult, is not impossible, with the easiest way leading along the Rivand river bed from the village of Rivand. Thus, if the function of the building called Khone-ye Div as a temple of fire is accepted, its use as a pilgrimage center needs to be taken into consideration. As we know from ancient written sources, a temple of one of the three “Royal Fires” known in Zoroastrian tradition was located in Khorasan. It was the temple of Adur Burzen Mihr (spelling variations: Borzin Mihr, Burzim Mihr, Burzen-Mehr), associated with the lowest social classes of herdsmen and farmers; fires of the two higher categories were associated with priests and warriors. The temple of Adur Burzen Mihr must have attracted numerous pilgrims. If the identification of the ruins called Khone-ye Div (which in Persian means “house of the devil”) as a temple of fire and a pilgrimage centre is correct, it is also possible to see in it a temple of Adur Burzen Mihr. This hypothesis, however attractive, needs to be confirmed by more indisputable evidence. Questions concerning other specific architectural features of the temple complex will be answered next season. It is highly probable that there were some Zoroastrian structures not only on top of the rocky spur, but also at its foot. This assumption seems to be corroborated by local villagers’ claims regarding stone structures apparently emerging from the ground by the stream bank and ancient coins being flushed out by the gushing stream during rainy months.